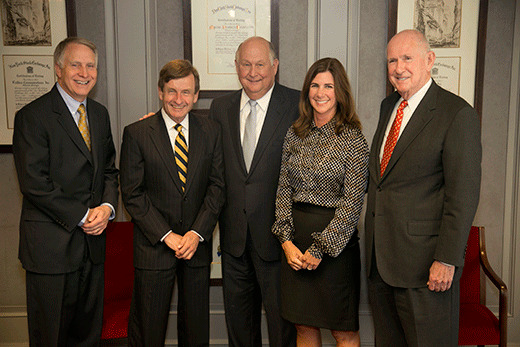 Emory President James Wagner (left), and Dean James Curran recently met with members of the Rollins family to thank them for their exceptional generosity. They include Gary Rollins (center), Amy Rollins Kreisler, and Randall Rollins. A recent $10 million gift from the O. Wayne Rollins Foundation will double the O. Wayne and Grace Crum Rollins Endowment Fund at the Rollins School of Public Health. Established in 1997, this unrestricted endowment provides support for the school’s highest priorities including recruiting and retaining key faculty leaders. The Rollins family’s commitment to public health has enabled the school to build the Grace Crum Rollins and the Claudia Nance Rollins buildings. Emory President James Wagner (left), and Dean James Curran recently met with members of the Rollins family to thank them for their exceptional generosity. They include Gary Rollins (center), Amy Rollins Kreisler, and Randall Rollins. The $10 million gift continues a long relationship between the Rollins family and Emory University. In addition to supporting the Rollins School of Public Health, their major gifts include funding for the Rita Anne Rollins Building at the Candler School of Theology and the Health Sciences Research Building. “My grandparents, O. Wayne and Grace Rollins, believed in giving to living institutions that would affect people’s lives,” says Amy Rollins Kreisler, executive director of the O. Wayne Rollins Foundation. O. Wayne Rollins, a native of north Georgia, was a self-made entrepreneur. He and his brother John participated in many successful business ventures, including radio and television stations, cable television, oil field services, truck leasing, boat manufacturing, real estate and the 1964 purchase of Orkin, Inc. Following his death in 1991, his sons, Randall and Gary Rollins, have continued to build the Rollins companies. The O. Wayne Rollins Foundation, created in 1967, continues its mission to improve the physical, mental, and spiritual well-being of people, predominantly in the state of Georgia. Improving the health of individuals and entire communities can begin with a single gift. At the Rollins School of Public Health, students learn to identify, analyze, and intervene in today’s most pressing public health issues. Because of its proximity to the U.S. Centers for Disease Control and Prevention and numerous state and regional health agencies, the school’s setting is ideal for hands-on research, collaborations with the world’s leading public health agencies, and interdisciplinary work with national and international organizations. To support the Rollins School of Public Health at Emory University, contact Kathryn Graves, associate dean for development and external relations, at 404.727.3352 or k.graves@emory.edu.